I will be using the original photo on the left than can be downloaded here. Select the "Measure distances and angles" tool. Click and hold a point right on the horizon, drag to another point on the horizon. 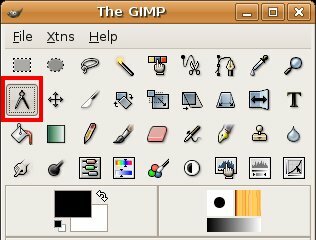 GIMP will draw a line right on the horizon between the first click point and the release point. At the bottom of the window it will give you two pieces of information, the distance between the points and the angle, we are interested in the angle. 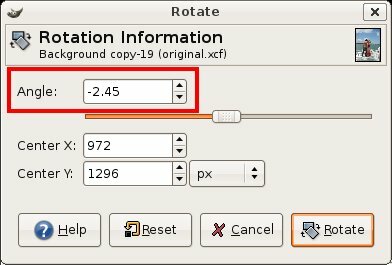 Rotate the image using the Angle field by the amount shown, a positive number will rotate the photo clockwise, a negative number will turn it the other way. The problem now is that the image has transparent corners. Clone nearby image into them. Crop the photo (my preference is to crop).